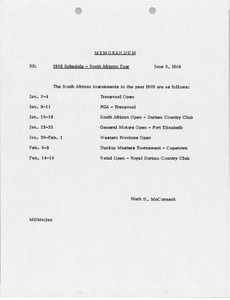 South Africa - Communicating the dates for the South African tournaments for 1969. 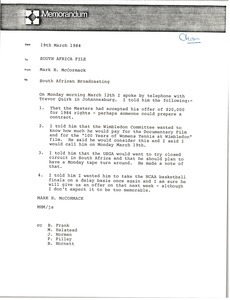 South Africa - McCormack notes his conversation with Trevor Quirk regarding the Masters offer, the Wimbledon documentary film, closed circuit television and the National Collegiate Athletic Association. 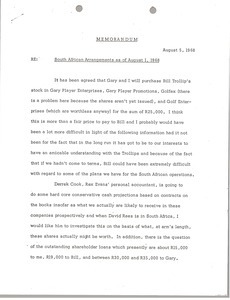 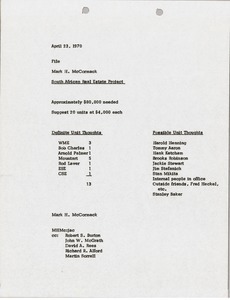 South Africa - McCormack records notes regarding the South African Real Estate Project, including approximately how much money is needed, the number and cost of units, as well as lists of names for definite unit thoughts and possible unit thoughts.